And so it begins! 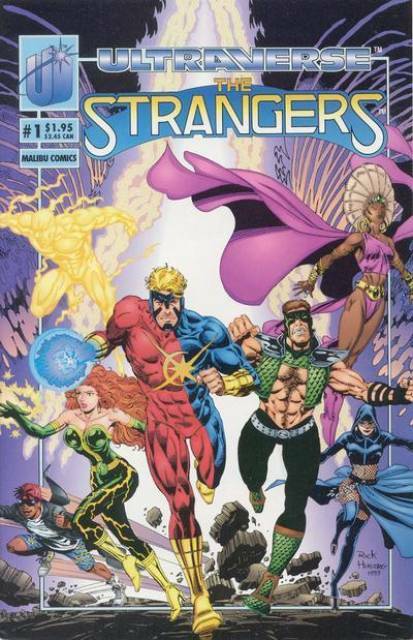 The Ultraverse really gets going in this story as 59 random people onboard the Powell Street Cable Car in San Francisco are struck by an odd lightning bolt from the sky. While the passengers appear to be unharmed, a driver is struck in the head by a piece of shrapnel, leading to him becoming — wait. That’s another Ultraverse title entirely! Let’s stick with the folks who will become The Strangers, okay? We’re quickly introduced to the majority of the cast, as many of them are watching as jerk millionaire J.D. Hunt is fondling a compliant young woman named Candy. His actions disturb many of the passengers and several of them toss Hunt off the cable car just before the lighting bolt hits home, preventing him from becoming one of the recipients of power. What’s that, you say? Recipients of what-now? Well, it seems that the people struck by the bolt are changed… Candy seems quite different in personality right away and bolts off from J.D. Hunt, much to his dismay. Bob Hardin and Hugh Fox, students at the San Francisco Art Institute, quickly learn that they they are able to transform matter and explode shrapnel from their body, respectively. Elena LA Brava, fashion designer, is able to hit anything that she aims for, Dave Castiglione is able to utilize various powers by changing through the colors of the spectrum. Sixth grader Leon Balford finds that he has superspeed, which helps him in avoiding some of the local toughs in his neighborhood. This 28-pager is packed with information and takes a lot longer to read than most modern comics. Englehart really delivers with witty dialogue that helps differentiate the large cast. Rick Hoberg’s pencils are a far cry from those of my favorite comic book artists (George Perez, Alan Davis, etc.) but he delivers with some great panels showcasing facial expressions and poses. This issue introduces a number of important concepts — the Jumpstart event itself, J.D. Hunt and the Night Man. While we don’t get any of the heroes in their costumes or with their code-names yet, it’s easy to see where it’s all going to come from since Elena is busily sketching away costume designs in the story. Re-reading this book, I was struck by how enlightened Englehart was in terms of subtly introducing topics such as misogyny and homosexuality. Elena is beautifully depicted by Hoberg throughout and I found myself quite drawn to the character, more so than I was when I first read this story back in (gulp) 1993. Candy’s lingerie gets quite a few interesting reactions in the story and while I appreciate the lovely form that Hoberg graced her with, I’m looking forward to seeing her a bit more covered up in future issues. 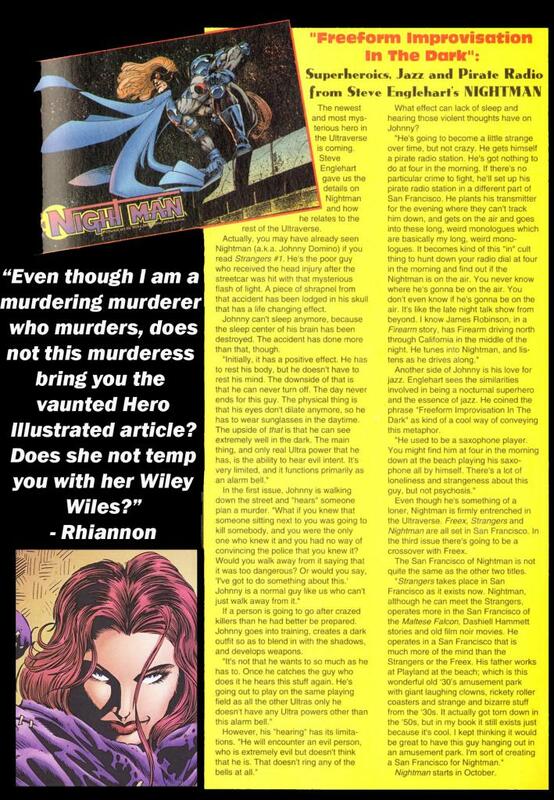 In the next issue blurb: “You’ve been here at the beginning of The Strangers and the secrets of the Ultraverse! Strangers # 2 keeps it rolling next month in: HEY, HUGH, GET OFF’A MY CLOUD!” As we’ll see at the start of the next issue, that title is actually not quite correct… leading to one of the more groan-inducing moments in the series. Can’t wait, can you? We’ll be back soon with a look at issue two.